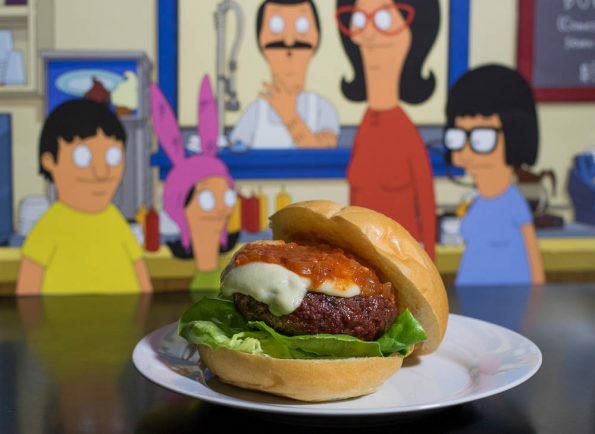 One of our favorite shows right now is Bob Burger’s. Food related and hilarious, it is totally in line with Geeks Who Eat. One of the shows running gags is the Burger Board burger names. They are hilarious! The Sound and the Curry and The Final Kraut Down are just a few of the punny burger names. Imagine our delight when we heard there was a cookbook with recipes based on these burger puns! How did the original website come about? Some point during the winter of my senior year in college I realized that I had no idea how to cook. Sure, I could add heat to food and then eat it… but that’s not really cooking. I wanted to learn how to make delicious things in the kitchen without following a recipe word for word. I needed a way to experiment with flavors and cooking techniques inexpensively, and without dedicating an entire day to one dish. As my roommate and I were watching Bob’s Burgers for the first time – it hit me. Gourmet Burgers! What if I just tried to make the burger from the show!? I’d do one burger every week, and keep a blog about it just like Julie did in Julie and Julia! 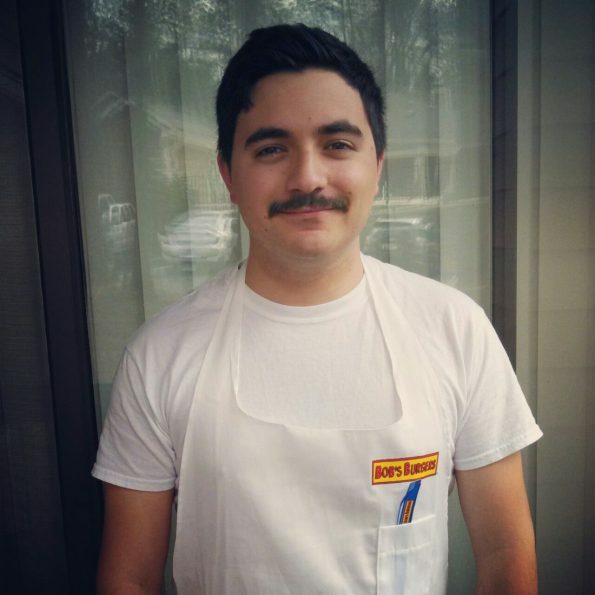 What was the process like for creating the burgers? I’d take the ingredient from the burger of the day, and do a lot of research on dishes that included it or flavors that it paired with. Then I’d try and adapt that to fit onto a burger. The first burger was the Foot Feta-ish Burger. Okay, so it has feta cheese. What do you do with feta cheese? I’d heard of feta stuffed burgers, so I tried it. As I became more experienced and comfortable in the kitchen, I started to get more adventurous. When I had made the “I Know Why the Cajun Bird Sings” burger, I’d never made a gumbo before. I called the blog “The Bobs Burger Experiment” because that’s what I felt I was doing – experimenting with new ingredients. It was all about trying new foods and learning what to do with flavors. Which of the recipe is your favorite? My favorite burger is probably the most basic – the Bruschetta-bout-it Burger. Die-hards will tell you it’s not a real burger of the day – Bob made it during his brief stint as a local tv chef in Season 2 episode 9: Beefsquatch. It’s just bruschetta on top of a burger with a piece of mozzarella to hold it all in. Nothing beats the nice springy taste of fresh basil and mozzarella with sweet tomatoes. The runner up for favorite took me by surprise though – Blue is the Warmest Cheese Burger. I love buffalo wings, but have never ever liked bleu cheese dressing. Making my own really helped – this burger is delicious. Do you have plans for any other geeky food websites/cookbooks? I have some ideas, but I wouldn’t say they’re planned out at all. I thought it would be fun to put out a Jimmy Pesto Pizza and Pasta cookbook, as a competitive retaliation to Bobs. I’d also considered a Halloween themed cooking blog, Goth Eats, which would feature mostly black and white foods. I think I just wanted an excuse to cook with cuttlefish ink. Which Bob’s Burgers character do you identify with most? Why? More than anyone else, I relate to Bob. I mean sure, I sort of look like him and I’ve spent hours in the kitchen cooking ridiculously punny burgers, but I think what makes me identify with him most is his creative spirit. Bob has a stressful job and tries every day to find an outlet for his creativity. I also need to find outlets for my creativity, and I’m incredibly grateful to Bento Box and Fox for helping me share that creativity through our new cookbook. We couldn’t review the book or even share an interview without trying one of the burgers ourselves. We chose The Texas Chainsaw Massa-Curd Burger. Not only do we love cheese curds and spicy food (this burger has habaneros in it), but Texas Chainsaw Massacre is one of our favorite horror movies! The recipes in this cookbook are easy to follow and delicious! We loved our burgers! Just the right amount of heat and the homemade ketchup was amazing (we have leftovers and can’t wait to use it). We want to thank Cole for taking the time to speak with us about his awesome recipes! (P.S. 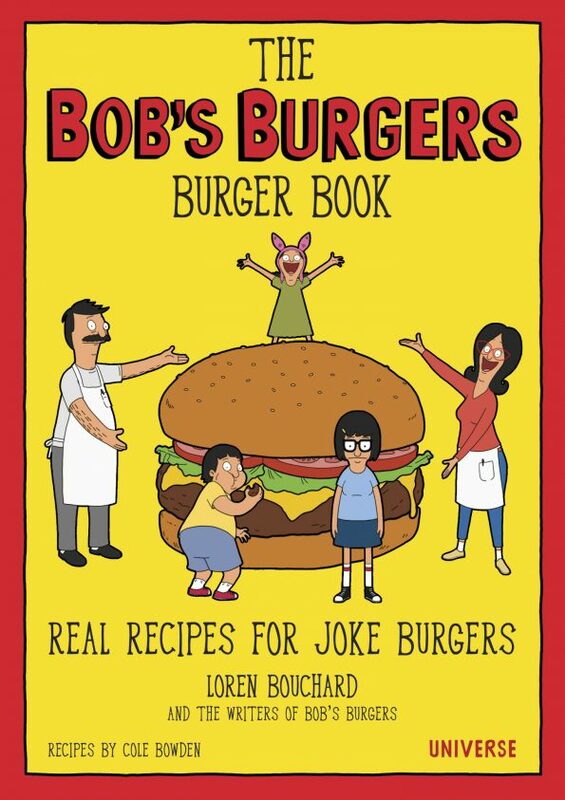 Cole if you are reading this, we want in on the Halloween recipe site) This book is definitely a must have for any Bob’s Burgers fan, whether you cook at home or not. We also want to take a second to thank Rizzoli International for allowing us to share one the book’s recipes with you! Have you already purchased the book? What recipes have you made? Do you have a favorite recipe board pun or your own recipe? We’d love to see it! Comment below or use the hashtag #GeekEats. Saute the onions with a bit of olive oil over medium-high heat just until softened. Turn the heat to low, and add the ginger and garlic. Cook, stirring occasionally, until the onions are translucent. Turn the heat up to medium-high and add the vinegar and brown sugar. Stir until sugar has dissolved and then add the tomatoes and simmer for 30 minutes. Season to taste with salt and pepper. You just made custom ketchup. Set it aside. As is, it will be on the chunky side (like the best of us) but if you prefer smoother ketchup, puree the cooled sauce in a blender. Without ever touching your face or eyes (or a baby or a small dog), mix the chopped habaneros into the beef and form 4 patties. Immediately wash your hands then season both sides of the patties with salt and pepper. Then wash your hands again. Cook your patties as you normally would. Right before they're done, top the burgers with the cheese curds and cover or tent to help them melt. BUILD YOUR BURGERS: Bottom bun, lettuce, burger with melted cheese curds, a generous helping of ketchup, top bun. Turn to your guests and say, "Has it oc-curd to you that you're about to eat one of the best meals of your lives?" Wait for that to sink in. Now look away awkwardly. *The Geeks were not compensated or given any comped items to facilitate this write-up and interview; Recipe shared with permission from Universe Publishing: A Division of Rizzoli International. All opinions are wholly our own. View our Disclosure Policy for more info.